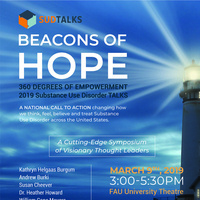 The Delray Beach Drug Task Force, in association with the FAU Phyllis and Harvey Sandler School of Social Work, is proud to present SUD Talks 2019. This is an annual, must-see event open to students, faculty, staff, and the South Florida community. Hear dynamic and engaging speakers deliver compelling messages surrounding substance use disorder: prevention is essential, treatment works, and recovery is attainable and sustainable. Then walk away filled with hope and an understanding of how we can all reduce stigma and make a difference! Lecture, Lectures, colloquia, seminars, etc.